This type of webpage is designed to present your pictures in a gallery format, either as 1, 2 or 3 columns. With the standard JustType package up to 12 pictures can be displayed on each Gallery page. It’s an excellent way to simply display your products or show visitors your workmanship. Each photograph can have its own caption and notes, with each photograph and caption optionally linked to other webpages in your site or to an external website. 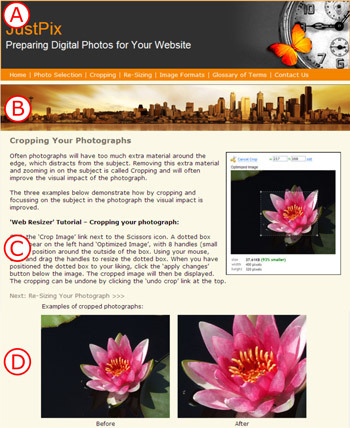 The example below shows the Masthead (A), Banner picture (B) and Header (C), which has a headline, paragraph text, picture and a link, followed by a Photo Gallery (D). In this case the Photo Gallery is formatted in two columns, with a caption below each image.